How to choose the best barbecue? With the long summer days and balmy evenings, the barbecue season is firmly upon us. Two-thirds of UK households own a barbecue. Are you thinking of replacing yours? Or buying your first one? From cheap-and-cheerful lightweight sets to bespoke-built stoves and outdoor gas kitchens, the range of options available on the market can be bewildering, with prices ranging from few pounds to thousands. Price is not the only indication of quality, though, and when choosing your barbecue, it’s worth taking into account several aspects of the device. Gas barbecues tend to be more expensive to buy, and to have higher running costs, but once you fire one up, you can start cooking immediately and you have a better control of temperature. This means that it’s easier to cook evenly, and with larger grills with multiple burners, you can cook at different temperatures at the same time and keep cooked food warm. They are also slightly less messy - no ash to get rid of. Charcoal takes some time to get going, as the embers need to be hot for optimal cooking results but it gives grilled food a distinctive, unmistakably smoky flavour. This can be mimicked by using a gas barbecue with special wood chips, but nothing but the real thing will replicate the succulence that slower grilling over charcoal gives to grilled meat, locking in the moisture and all the flavours. Plus there is the sheer fun and excitement of preparing the barbecue and cooking caveman (or cavewoman!) style. Although portable barbecues are great for modest gardens, and small ones can be easily transported for a picnic or used when camping, a built-in barbecue will create an attractive focal point in your garden and avoid the hassle of wheeling the device out and setting it up. If you decide to buy a portable barbecue, make sure to check the wheels/castors are sturdy and provide enough support and the whole thing is set on a flat surface to avoid disasters. 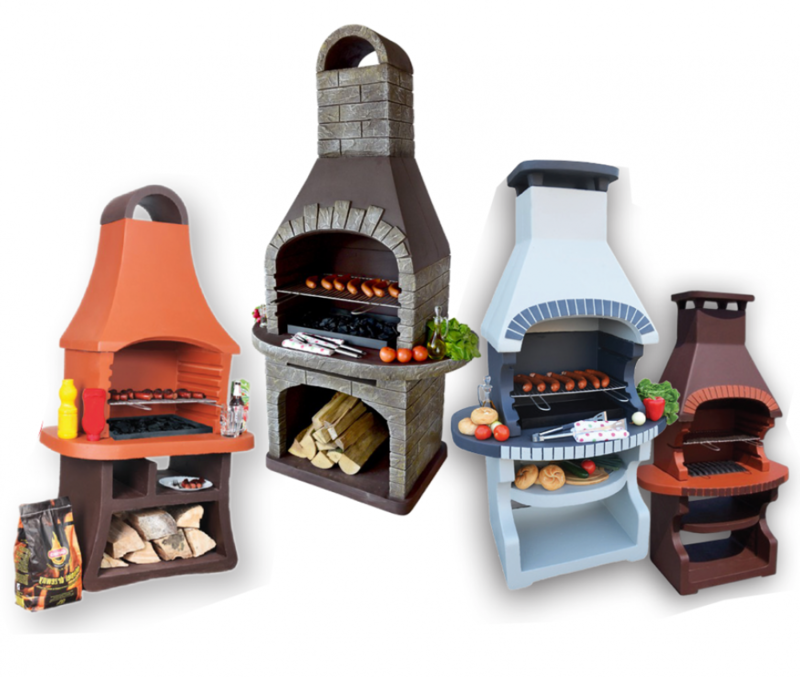 Masonry barbecues look stylish, can work as an outdoor heater as well as a barbecue and, built from a combination of bricks, stone and/or reinforced concrete, are sturdy, solid and resist the vagaries of weather, providing many years of service. Hood and air vents – a barbecue with a lid will allow you to avoid food that’s burnt on the outside while undercooked inside. A hood with vents will allow you to control the cooking process better by regulating the air supply. A lid will also help to protect your barbecuing from wind or passing drizzle. Griddle or hot plate – useful when cooking smaller pieces of food, whether meat or vegetables, that might fall through gaps in the grill; or for food that might stick to the grill or disintegrate, like fish fillets. Other accessories – including a rotisserie spit, kebab skewers, thermometer (either built in or one that you can use to check specific pieces of meat), tongs and spatulas. Shelves – handy for keeping utensils, seasoning and where else would you place your drink when tending to the food? Grill material – a cast iron grill keeps the heat, but a stainless steel grill is lighter and easier to clean, while porcelain-coated grill will be easy to clean and durable but can chip which means you will need to replace it. Chrome plated grills are the cheapest, but is most likely to rust and require replacing quickly. Storage – when not used, where is your barbecue going to be kept? If it is to remain outdoors, a sturdy cover that can be firmly tied will be essential to avoid weather damage to a barbecue made of metal. If you are to store it in a shed or garage, make it accessible enough so you don’t need to rummage through mountains of boxes and assorted junk every time you fancy a spontaneous outdoor cooking session!